The Zhangjiajie Grand Canyon Glass Bridge is the world's tallest and longest pedestrian glass bridge in China and worldwide. The Opus project was designed by Zaha Hadid Architects, for Omniyat in Dubai. It is a 20 story fully glazed building, resembling a cube with the core melted out. The outer flat facades are neutral transparent glazed with silver mirror pattern, while the core area is dark blue 3D formed glazing. To achieve this vision, several glass processing technologies were studied, selected, specified – and some abandoned after further studies. The project implemented several newly developed technologies, pushing the limits of the industry. Challenges included achieving the 3D double curved shape, achieving the color, achieving adequate performance for Dubai climate, dealing with the radiation focusing effect the geometry imposes, ensure seamless visual appearance among different support systems – roof, wall, soffit- , procure special materials in sufficient quantities in reasonable time and keeping the project affordable. The presentation will give a summary of the project’s technical development. In contemporary architecture, glass often takes the pretentious role of something that is absent, a fully transparent, non-existent material where one can look right trough. However, a mute material that says "I'm not there" refuses to establish a relationship with the people that live in the building. This might be one of the reasons people often feel alienated in contemporary buildings. Neutelings Riedijk Architects follow a radical opposite path. In their projects they bend, blur color, or pour glass to make it a robust and characteristic material. A glass that tells stories, that obstructs the view, that speaks to the visitors. These interventions give a specific identity to a building. It involves the development of new glass production techniques and intense collaborations with artists, as demonstrated in public buildings such as Beeld en Geluid in Hilversum or the MAS Museum in Antwerp. Glass is for sure a fascinating material. It is used in many projects of our practice for a long time. The talk will give an inside on what was done (including some latest projects) and what are the subjects we want to think about in the future. Since this approach has to do with cooperation as well as interdisciplinary thinking some aspects of this general ideas will be shared. Synergies can be found in many aspects of what was developed during recent years. Some of these will be highlighted. Transparency has become a new division of architectural theory and practice and has created a new kind of aesthetic sensibility, o a wealth of possibilities for visual expression The growing importance of the visual aspects in architecture is obvious, especially with respect to façades. Transparency is no longer limited to specific functional purposes (e.g. illumination of the building’s interior), but becomes a tool of formal expression itself. This raises questions regarding the theoretical/ideal/institutional background for the application of architectural glass and impacts the perception of architecture by observers. The paper presents a general outline of ideological/institutional inspiration for architectural practice in the perspective of new types of architectural transparency. Monolithic glass shells can be constructed in limited sizes. Segmented shells allow coverage of larger spans. Three shell systems - spherical dome, cylindrical roof and hyperbolic paraboloid were segmented using four different curved glass segment shapes – square, diamond (or pie for dome), hexagon and hexalock. Three joint materials were analysed- glass (resulting in a monolithic glass shell), silicone (soft adhesive) and epoxy (hard adhesive). A Reissner-Mindlin finite element was used in ANSYS to discretize the modelled geometry. The boundary conditions were setup keeping in mind the favourable membrane behaviour of shell structures. It was found out that glass segment shape and joint stiffness has an influence on the shell behaviour. Optimal shapes show similar behaviour in comparison to monolithic glass shell. Others show a significant increase in the deflection and bending moment values which is unwanted. The in-plane membrane forces remain unaffected and thus are found to be independent of glass segment shape and joint stiffness. Folded glass plate structures have the potential to become the next generation of structural glass. By connecting glass plates along their edges and creating a folded plate geometry, glass can be used to transparently self-span large areas without the need for additional supporting structure. An experimental glass connection is used as a basis for this paper. Available test and numerical data is used to create an interaction diagram for this connection, giving allowable axial forces, shear forces and bending moments. Due to the dependency of folded plate structures on geometry, a parametric numerical analysis approach is developed. This captures the global behaviour of the structures whilst also being calibrated against the local behaviour of the connection detail. The approach is based on established techniques for structural glass analysis using the finite element software Strand7. The results are presented graphically, illustrating that connection utilization drives design. It is shown that parametric finite element analysis is a powerful tool to extend feasibility-studies for new shapes and configurations. Glass has been in existence for more than four thousand years. Techniques of manufacturing and design have since been under constant development. Today, we face new opportunities and challenges with respect to structural glass applications. This paper will explore objectives as to why glass is specified on building projects and outline key parameters which must be considered when designing with structural glass. A holistic approach and emerging design and construction techniques such as digital design, multi parameter optimization techniques, bar coding of glass, additive manufacturing and the potential of Building Information Modelling (BIM), will be discussed. Lateral thinking and examples from other industries will be presented and the paper will be briefly summarized. The geometric complexity resulting from the architectural pursuit of freeform structures is presenting challenges to the construction industry. Curtain wall unit system designs, for example, have morphed in some cases from predominantly flat orthogonal affairs to complex double-curvature multi-layer constructs. Many fabrication tools and processes, however, are only gradually shifting from their linear 2D roots to embrace a truly 3D fabrication environment. The validation and quality assurance of geometrically complex components is problematic in such an environment, potentially compromising both dimensional accuracy and throughput. Three projects are discussed where laser metrology was adopted as a means to facilitate the dimensional measurement of geometrically complex components. For example, one is a high-profile architectural application, a residential building in New York City. The project includes an expansive double-curved surface designed and constructed as a prefabricated unitized system, with opaque units built up from multiple layers of metal panels, insulation, and structural framing. Laser tracking metrology was adopted during the course of project fabrication resulting in accelerating production rates from four to thirty units/week. In addition, drawing requirements were reduced from as many as twelve to zero drawings per unit. Applications, processes, techniques, and findings resulting from the integration of laser tracking metrology in the fabrication process are presented for all three projects. Enclos is conducting ongoing research into cold formed (elastically deformed) glazing. This paper expands on previous finite element modeling and physical testing undertaken. The research aims to develop an understanding of surface buckling of perimeter-supported, monolithic glass that has been elastically deformed in torsion. By extension of previous research, strategies are found to maximize the achievable twist of the glass as limited by strength or stability. This paper includes a detailed investigation of these strategies, incorporating results from finite element models and data from physical testing. The magnitude of twist achieved by elastic deformation of flat glass can be maximized primarily by reducing the short dimension of glass while also reducing the thickness. The thickness of the glass plays a secondary role in optimizing the magnitude of twist achievable. If the lite is too thin, buckling will govern. If it is too thick, stresses due to the elastic deformation during the cold forming process will govern. A set of plots based on the research also helps convey the relationship between thickness, short dimension, aspect ratio, and achievable twist magnitude. The fabrication of projects with complex geometries often implies a significant waste of material, since custom molds need to be created and irregular shapes need to be cut out of larger sized elements. For low curvatures, cold elastic bending processes can be applied. However, elastic bending techniques have mainly been utilized to create simple curvature panels for architectural projects. This paper explores computational simulation in relation to a digitally controlled fabrication method of bending rectangular glass sheets elastically into irregular double curvature. This is done through exploratory prototyping within the framework of a Master of Science course on digital production, and additional computational modeling and FE-analysis. We used algorithmic real-time simulation to approximate the bending process of cold-bent glass and elaborated on details of the simulation process and possible surface types and curvatures. Our empirical tests on simply curved, ruled and doubly curved surface types used float glass as well as heat-treated glass. A detailing system was developed to clamp the glass panels into position. We evaluated the results of the computational simulation (Rhino with plug-ins) as well as FE-Analysis (Strand 7) and compared the resulting geometries to the measurements of the physical prototypes. In order to demonstrate the system’s capacities on a larger multi-panel geometry, we constructed a 5m x 4m prototype of a doubly-curved glass surface. The evaluation of adaptive facades presents a challenge because there is no established evaluation strategy to systematically reach this goal and many of the available façade performance evaluation tools have limited applicability for such advanced building facades. This paper presents a case study for an adaptive glass façade and evaluates its performance. The evaluation focuses mainly on pre and post construction phase of adaptive facades: The design assist phase (including the durability test, visual mockup, onsite panel mounting and weather stripping), the commissioning phase (field verification and performance testing) and the monitoring phase. The selected project is a nearly zero energy building with unique façade comprising thermal isolated glass sunshades printed with white silk screen. These louvers respond dynamically and automatically to the angle of the sun which improves the control over energy consumption, solar radiation and glare with the ability to admit natural light into the building. The paper is part of the research activities of working group 3 of the European COST Action 1403 on “Adaptive Facades “. Different methods were used for evaluation, this include: interviews with the architect, façade engineer and technical control specialist, reviews of standard and codes and a systematic process mapping. A documentation of the case study describing the post construction occupant comfort and façade operation was prepared. This paper’s audience is mainly architects, building façade engineers together with facility managers concerned with the process of design, construction and operation of adaptive glass facades. The outcome of this study identifies effective strategies for the design and performance evaluation of optimal adaptive facades. Glazing units used for architectural applications have an enormous potential for optimization. Currently, daylight management as well as solar and shading control can be provided only through a combination of various individual elements, such as glass panes, venetian blinds and additional glare protection elements. This combination of several separate elements not only leads to a higher consumption of resources, as well as higher production costs. It also entails additional maintenance costs. In order to overcome these shortcomings, the authors have developed a switchable glazing unit with adjustable light and energy transmission properties. This unit uses an anisotropic liquid. The functional component consists of a liquid crystal layer enclosed between two coated glass substrates, thus it is an integral part of the glazing unit. Due to the structure of the conductive layer, it is possible to subdivide the glazing unit into small areas (so-called pixels) that can be switched individually. The transparency of each pixel can be controlled independently. The glazing unit itself can be used as an effective daylight and shading control. This integral approach opens the door for new architectural applications. The authors currently focus their research on the development and tests for control strategies of the switching process itself. These control strategies are numerically validated and then tested at the ILEK façade test facility. The paper presents the first results of a performance analysis based on numerical simulations. Energy saving and environmental protection don’t represent only a technical problem but also, and maybe most of all, an ethical problem. From this point of view, the Mediterranean area, characterized by a considerable Sunshine for at least 8 months a year, is configured as particularly suitable for the use of all building systems that can reach the objectives provided by the latest global climate conferences. The architectural heritage of the Mediterranean area is various both in typological terms and in relation to building materials used. If you want to find materials and components common to the area certainly the windows, and exacting the glazing linked to them, represent a very significant element that can considerably contribute to energy savings. Our group is concerned, since 2009, to test the behaviour, in the energy field, of electrochromic glass. The phases of the studies, presented at many conferences, have already demonstrated efficiency in terms of savings that can be achieved by envelopes integrated with the EC. The testing, conducted on full scale models, was divided into three steps temporally sequential. We built two identical test rooms each other for exposure, size (4x4x2.70 m) and of the envelope composition. Traditional low-emission panels were put in place in the first room, the EC glass were placed in the second one. Measuring tools were positioned in the test rooms, to detect the most important internal thermo physical parameters. This study is divided in three steps, according to a façade configuration with glass surfaces gradually increasing. The research compares internal conditions, detected during the three phases, and it clarifies the relationships between façade configuration and both inside and outside circumstances. Today’s green building certifications such as LEED, BREEAM, and HQE all recognize that a sustainable design is not just about energy efficiency and all integrate sections related to indoor environment quality, such as provision of natural daylight and views through windows. Yet, on the other hand, with the increasing stringency of building energy efficiency targets in Europe and indeed globally, we are observing an increasing trend to reduce window area in new building energy codes, as windows are often seen as the weak link in the building envelope. Creating both energy efficient and comfortable well daylit spaces could thus be a significant design challenge. Electronically tintable glass, also known as electrochromic (EC) glass, allows the building façade to become dynamic, changing the transmission of the solar heat and light in response to the exterior environment and the needs of the building’s occupants, while always remaining transparent. It thus offers a solution which avoids having to trade off daylight and views with energy performance, allowing more glass to be used without energy penalty AND without causing thermal or visual discomfort for occupants. New developments in the EC technology are reviewed here, as well as a range of new case studies of retrofit and new construction, where dynamic glass has provided increased flexibility for designers, and optimum balance between energy performance and comfort. In all cases, this technology empowered the architect to achieve sustainable design goals, without restricting their design freedom and aesthetics choices. Despite the great potentials of glass as a construction material, its brittle material behaviour poses major challenges to structural engineers when designing load-bearing glass structural members. This paper presents the load response and the failure behaviour of float glass–GFRP hybrid beams, when used as a mean of improving strength and ductility of float glass. Hybrid beams made from two layers of float glass sheets and an adhesively-bonded semi-transparent pre-cured GFRP interlayer were tested in four-point bending. The experimental results showed that double layer hybrid beams continued to take load even after the formation of the first major crack, and the beams were stronger and ductile than conventional single and multilayer float glass beams. Once the bottom glass layer has cracked the combination of the GFRP and the top glass layer carried the applied load whilst the gradual decrease in the stiffness due to the formation of new cracks ensures a ductile failure. Experimentally-validated finite element (FE) models that predict the evolution of stresses, stiffness and failure load of single and double layer glass beams, and glass– GFRP hybrid beams are also presented. Safety glass is usually the proper designer choice when glazing may be subjected to the impact of a person. In order to avoid people injuries, glass products must comply with appropriate safety practices. Existing technical standards classify safety glass products by mode of breakage and post-breakage behavior. Critical demanding applications in terms of self-weight saving, like high efficiency elevator cars in buildings or aircrafts and other means of transportation interiors in aerospatial and automotive industries, are currently driving the innovation in the development of safety glass. In this framework, glass-polycarbonate composite panels offer a lightweight alternative which is at once able to preserve the aesthetic and safety aspects of traditional laminated safety glass. The aim of this paper is to present an experimental investigation on the performance under impact of thin glass layer with a cellular polycarbonate backing joined together by an auto-adhesive interlayer film. Different coatings (mirror and paint) at the glass-adhesive interface are also taken into account. 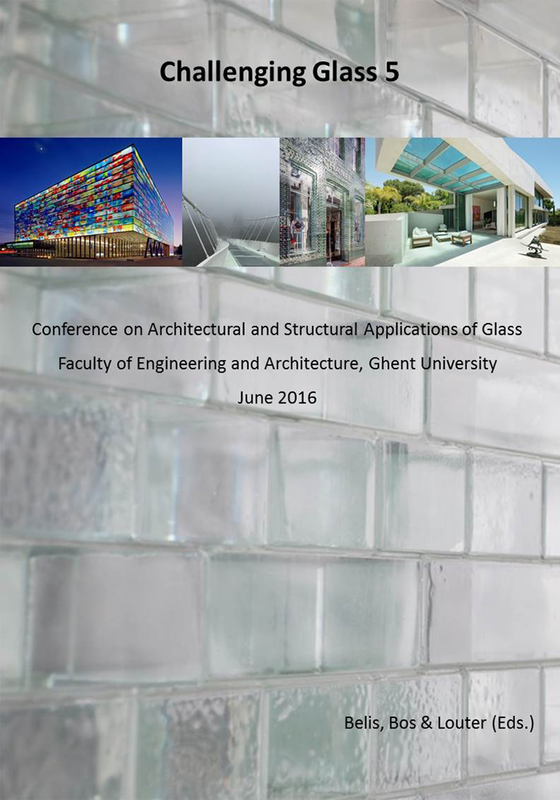 Recent research work focused on material efficient and safe structural use of glass beams. Reinforcing and post-tensioning of those structures in the style of reinforced concrete are promising options. They allow for a safe post-breakage behaviour of load bearing glass constructions. Other ductile materials such as steel and high-grade cables strengthen the glass, which results in robust structures. However, hybrid structures are prone to temperature loads. Especially post-tensioned glass beams – Spannglass Beams – are vulnerable to lose part of their initial cable load caused by a different expansion of their parts. The thermal expansion coefficient of steel cables is about 70% larger than the value of glass. Therefore, a cable in a hybrid structure will expand much more during heating. This effect results in a loss in initial cable load of a post-tensioned reinforcement, and cannot be prevented. Hence, the temperature dependency needs to be considered during the design stage. Furthermore, a change in temperature influences the material properties of glass-contact materials and the interlayer. Thermoplastic blockings transfer the cable load into the laminated glass edge. Due to manufacturing tolerances, the interlayer material is stressed. Therefore, this will affect the reaction of the structure to a change in temperature. The non-destructive experimental study includes the results of a set of two Spannglass Beams with 8 mm post-tensioned cables. Adhesively bonded connectors redirect the cables according to the needs in a four-point bending set-up. Two-meter long beams were placed in a climate chamber to heat the specimens from ambient temperature to 60°C. We recorded the structural behaviour at alternating initial cable loads as well as different bending loads. Finally, the results led to a recommendation on how to consider a possible loss in cable load caused by a change in temperature. This will support the argumentation that post-tensioning glass beams is a feasible structural option. The mechanical performance of photovoltaic modules has not been adequately characterized for use as glazing product in the building envelope. As a result, the modules are subject to individual approval by the building authorities in many building-integrated applications. This paper presents experimental research on glass based photovoltaic modules, analyzing their mechanical properties in comparison with regulated construction products. The focus is on the influence of photovoltaic thin-film coatings on the bending strength of the float glass used as a substrate or superstrate and on the post-breakage behavior of glass-glass modules. The four-point bending test according to EN 1288-3 was modified in terms of specimen dimensions in order to test full-size photovoltaic glass panes. The modified set-up was verified as a suitable and simple test method to determine and confirm strength values. Edge ablation was found to reduce glass strength rather than the PV coating and cell scribing processes, but the reduction is less than 10 % and the minimum strength value of float glass can still be met. Residual strength testing of glass-glass photovoltaic modules in different load and temperature scenarios showed that the integration of crystalline silicon cells as well as thin-film solar cells improves the post-breakage behavior of glazings. A critical point may be mechanical failure within the layers of thin-film cells on glass associated with the potential danger of broken glass pieces falling down. Standard glass-glass module configurations appear to provide the same or higher residual strength performance as laminated safety glass, if the interlayer material is approved for use in laminated safety glass. The aim of the present paper is a preliminary assessment and critical discussion of full-scale experimental test results recently obtained for hybrid steel-glass beams composed of a laminated glass web and steel flanges, based on the analytical Möhler method. As known, the structural response of this typology of hybrid solutions markedly depends on the stiffness and resistance of all its components, and specifically the connection, which act as a flexible shear bonding layer between the glass web and the steel flanges. Therefore, the appropriate mechanical calibration of the component materials is mandatory for accurate calculations. In order to fully characterize the used adhesive, push-out shear tests and simple shear tests were performed on small specimens. The results obtained from these small specimens are then implemented as main input mechanical parameters for the analytical model, so that this latter could be applied to the full-scale tests in view of comparative analyses. As shown, due to accurate estimation of the main mechanical properties of the adhesive layers, the presented analytical method provides rather accurate results for the examined full-scale hybrid beams, hence suggesting its application for practical calculations and pre-design considerations. Intensive progress in the field of polymer adhesives opens up new opportunities in their usage. Glass is combined with steel in hybrid systems to improve its load-bearing capacity, stiffness, residual load-carrying capacity and to preserve a high degree of transparency at the same time. Adhesive connection between glass and other materials in hybrid structures is beneficial, because in dependence on geometry and stiffness, the glue in joints can provide uniform stress distribution along the contact area. The current paper deals with the research study of two generations of adhesives. The study begins with a description of tensile behavior of dumbbell test specimens made from a new type of adhesive and its predecessor. Because shear connection is used in hybrid steel-glass beams due to its suitable stress distribution and good feasibility, both glues were tested in shear joint specimens to compare their properties. Both adhesives were also applied in the linear connection of steel-glass beams with the span of 4 m and compared to each other as the last step of the study. Developed by seele for industrial and commercial buildings, iconic skin glass sandwich panel (GSP) is a novel glass panel façade that meets high-level design and economic demands. The idea is to merge two established façade products into a new one: The glass sandwich panel consists of an outer printed glass sheet bonded to a standard sandwich panel. This creates a glass exterior in the form of panels up to a height of 15 m. These huge formats allow architects to employ glass sandwich panels to create homogeneous and flush façade surfaces in glass. This paper discusses the structural testing and numerical verification of the glass sandwich panel with a main focus on the silicone bonding between glass and sandwich. Furthermore, an outlook is given how to integrate window and door elements flush with the façade surface. The increasing demand for use of laminated glass in building facades is the driving force for new interlayers testing and their implementation. Architects’ and engineers’ requests require searching for new solutions and processes of lamination. Intelligent facades, electrochromic windows, integrated photovoltaics, integrated lighting, enhanced solar control, acoustic pollution reduction, wires incorporation, use of special sealants and glues are some of the design drivers of new laminated structures. Laminated safety glass is composed of two or more glass panes bonded by one or more interlayers. The interlayers are typically soft polymers like polyvinyl butyral (PVB), ethylene vinyl acetate (EVA), polyurethane (PU) or ionomer. Today, there are many interlayers on the market with a large variation in their properties. For some projects, it is a challenging task to choose the optimal interlayer. For the use in structural glazing (SSG) applications a new generation of warm edge system has been developed. This new technology is a spacer system based on polyisobutylene, especially designed for silicone sealed units, which replaces the conventional edge seal components: metal or plastic spacer, desiccant and primary sealant. In contrast to these components, this hot applied spacer system is an integrated polymer matrix incorporating the desiccant, which meets the high requirements regarding long term stability and in particular the demands for noble gas tightness of insulating glass units (IGUs) with silicone secondary sealant. In contrast to rigid spacer frames, this new spacer generation utilizes the whole inner gap size of the IGU to absorb movements caused by environmental stresses and allows full flexibility in shape of IGU. Excellent durability of the edge seal is insured by a chemical bond of the spacer matrix to glass and silicone secondary sealants. Due to the computer controlled application and the low permeability of the spacer the IGUs fulfil the requirements of the EN 1279-3 (gas tightness) even under standard mass production process conditions. This allows for an especially easy production even of triple IGUs, large formats and free shape designs with outstanding accuracy. The innovative reactive thermoplastic spacer is a new milestone in IGU technology with excellent durable energy efficiency for façades and contributes a significant step towards energy sustainability in building envelopes. The saving of energy has been an important topic for the last years. However, not only for building constructions but also in the field of naval architecture the energy revolution affected the used materials. Insulation glass units (IGU) are used on ships, because of their increased thermal insulation value, but their known problem of durability remains. Already after a few years, naval insulating glass units fog up on the inner site of the glass panes and get unusable. The insulating glass units are exposed to higher stress in the naval environment compared with building constructions. We have to consider comparatively high wind loads that results in thick glass packages. The dead weight of the outer panes are usually transferred via the edge sealant. Structural Sealant Glazing Systems (SSGS) without mechanical self-weight support are commonly used. Furthermore, there is the contact with saline water and high UV-radiation. Because of the movement of the ships around the world, the climatic load assumptions for stationary buildings do not apply. All these loads cause a pillow effect and stress the edge sealant to a point of an increased moisture transfer into the cavity. We conducted two-month artificial ageing tests according to DIN EN 1279-2. The experimental investigation included 67 insulating glass units and reference specimens, which are composed of 4 mm fully tempered glass and 12 mm cavity between the panes. The scope included bent and connected spacers, a variety of secondary sealant systems with an emphasis on novel permanent pressure equalisation structures. After the tests, it was possible to compare the moisture penetration of different edge sealant systems. Furthermore, we compared the aged with reference insulating glass units. We used these data to analyse the impact of the artificial ageing program on the sealants durability. The experimental investigation shows that the climatic loads have a strong influence on the gas transfer through the edge sealants of the insulating glass units. Systems, which enable the insulating glass unit to connect the gas cavity with the ambient air, absorb less moisture compared with reference systems. The results will allow us to evolve more durable sealant systems. Additionally, we can optimise the artificial ageing program for marine glazing products. Climatic loads on Insulated Glazed Units (IGU) have been investigated since the early 1990s. Beginning in 1996 a German technical guideline defined the procedure to respect climatic loads in static design of IGUs. Furthermore the required values of climatic changes and thermal changes of Double Glazed Units (DGU) have been determined. In practice, those values have been applied to other systems like Triple Glazed Units (TGU) as well as Double Skin Facades (DSF). In the last two decade’s those values haven not changed. This paper presents the results of a study on IGU’s in summer conditions, evaluating the thermal performance recent constructions. The upgrade from DGU to TGU causes a significant change of the thermal behavior. By adding a third glass layer, the middle glass gets insulated on both sides. In case of solar radiation the middle glass layer absorbs energy and is disabled to release energy. As a result, higher temperatures can be reached on TGU. By considering ventilated or not ventilated DSF’s, external or internal shading devices can influence further changes in the thermal behavior. This paper shows the development of an iterative calculation model by including present European standards. The model is able to deal with factors mentioned above. The results of different facade studies are shown and compared to the DIN 18008 standard. Furthermore the ongoing changes through European prestandards were discussed. Over all the study shows that a more sophisticated approach is necessary to determine correct temperature and climatic loads. Bonding of glass onto aluminum frames, known as “Structural Silicone Glazing”, has been applied for more than 40 years in glass curtain wall facades. Silicone sealants are being used in this application because of their outstanding resistance to weathering (UV, temperature, moisture, ozone), They also provide resistance to water egress and thermal insulation. Their role, structurally, is to resist to windloads and to compensate for differential thermal expansion of glass and aluminum frame. For windload resistance, silicone bite is calculated using a simplified equation which assumes a uniform stress distribution along the sealant bite. Finite Element Analysis (FEA) was used in this study calculate the stress distribution in the sealant as a function of sealant bite and thickness and show the importance of the sealant geometry (bite and thickness) on the local stress distribution. The study shows that for glass deflections in the 1% region (L/d=100), large sealant joints and/or high modulus sealants lead to higher local stresses. This study assesses the shear strength of long adhesive joints on mid-size specimens to resemble virtually a life-size situation in a typical timber-glass composite element. The specimens comprise a rectangular glass pane which is adhesively bonded along its vertical edges onto timber posts. The study focuses on three different adhesives ranging from flexible silicones to viscoplastic epoxies with a high stiffness. In the experiment, the adhesive joints are stressed in longitudinal shear and loaded until failure.The experiment is simulated using a numerical model of the specimen. The joint is described by basic material models taking into account linear or bilinear behavior of the adhesive material. The corresponding material properties of the adhesives were derived from uniaxial tensile tests on the cured adhesive. The stiff adhesive causes high stress concentrations close to the edge where the load is applied. More flexible joints lead to a more homogenous distribution since the shear loading result in higher compressive stresses in the lower parts of the glass pane. Finally, we compare the results from the experiment and the numerical simulation by means of glass stresses and shear deformation of the adhesive bond line. It can be shown that bilinear constitutive equations are an adequate approximation of the adhesive to determine the glass stresses in the pane. However, the deformations could not be reproduced for all adhesives in the same accuracy than the stresses. Architectural trends have tended towards curved glass envelopes and maximised transparency by reducing solid fixing areas. One approach towards transparent glass connections is a heat bonding process based on the principles of welding. This paper investigates the level of residual stress in soda lime silica and borosilicate glass caused by a heat-based connection or forming process. Nominal levels of residual stress prior to heat impact, directly after heat impact and after annealing will be measured on small-scale samples, utilizing a scattered light polariscope (SCALP). Material properties the large temperature range required for the heat bonding process have been identified to allow subsequent numerical modelling to verify the results obtained in this study. An experimental study has taken place to quantify the strength of single sided structural silicone glazing joints under blast loading. The structural silicone specimens in this experiment were tested using a high-speed servo-hydraulic test machine at varying rates, representative of that experienced in a blast. Tests were conducted at displacement rates of 1m/s, 2m/s and 4m/s. The load was applied at two different angles of 30° and 45°. The tests were carried out on samples with different bite depths. The load was measured and the strength of the silicone joint was calculated at different testing rates. For a given testing rate and loading angle, the strength was found to be constant for different bite depths. The strength also showed an escalation at higher displacement rates. For the loading angles tested, there was no correlation found between the angle of loading and the strength. Through the measurement of displacement during the test, the work done on the silicone joint was also calculated. SentryGlas® (SG) (a transparent ionomer from Kuraray) and Transparent Structural Silicon Adhesive (TSSA) (a transparent silicon from Dow Corning) are two of the adhesive materials used in laminated adhesive connections for structural glass applications. Although they have been used in several projects worldwide, failure criteria for these materials are currently not available in literature. This work gives an introduction to the theoretical development of a novel failure a criterion for TSSA and SG under varying stress state conditions. The main output of this work is a four-dimensional Generalized Triaxial Model (GTM) that accounts for a generic stress state by a governing equation expressed as a function of the three-dimensional stress tensor. Both deviatoric and hydrostatic energetic components are taken into consideration by means of a non-linear function of the two contributions. The effects of the model parameters are investigated by a parametrical study. The proposed model is then analytically compared to existing failure criteria. It is shown that many of the existing models available in the literature can be seen as particular cases of the proposed model. Although the GTM was theoretically developed specifically for SG and TSSA, the model can be generically used as failure criterion for many isotropic materials. The determination of load carrying capacity and serviceability of point fixed glazing is a challenging task. A lot of parameters have an influence on the resulting values, especially on stress values around the bore hole. Generally, only specialized engineers are able to perform this analysis. Reasons for this are the multitude of parameters, the lack of analytical solutions and incompletely analyzed load carrying mechanisms on the one hand, and on the other hand, the lack of a generally accepted and accurate design concept for stress and deflection calculation in Germany. The calculation of point fixed glazing is usually done by using finite element analysis (FEA). However, the scatter of the results is very large – which means that the quality can be evaluated as low. The reasons for these deviations are usually based on the deficient FEA software and an inaccurate modeling done by the user. Therefore, the user needs a guideline for the design process. A new design concept for point fixed glazing has been developed on the basis of analytical, experimental and numerical studies. This new concept consists of two main parts. The first part is a quality check of the calculation model. The user has to prove his model by reference values and theoretical principles. The second part deals with the actual calculation process of the whole glazing. This process has to be done as case-specific analysis. Thereby, it contributes to a safe and realistic design process in the field of point fixed glazing. In façade applications, structural sealant glazing systems with a soft adhesive like silicones show a number of advantages especially regarding brittle adherends like glass sheets, as stress concentrations in the adherends are avoided due to the large bonding area and the uniform load transfer. The application guideline for structural sealant glazing systems (European Technical Application Guideline ETAG 002) defines a simplified design concept for the silicone sealant, leading to high safety factors and restrictions in use. The material behaviour of the silicone sealant can be more accurately described using the Finite Element Method and hyperelastic material laws, but the results for the stresses at the edge area for a shear dominated loading are highly mesh dependent, due to the presence of a singularity and thus hampering the assessment of the realistic stress distribution. In this paper, shear tests on bonded connections with silicone, referring to the ETAG 002, are presented. Beside the overlap length and adhesive thickness of the specimen prescribed by the standard, two more overlap lengths and thicknesses are tested. For the experimental investigations, the force-deformation behaviour and the failure initiation, observed at the edge area, are recorded. Unlike for the adhesive length, an influence of the specimen thickness on the failure shear strain could be observed and predicted by the numerical simulations. A clear difference between the maximum load and the load at failure initiation was observed. There are different options to obtain a structural glass beam with a span of more than 6 meters. One option is segmentation, which has many advantages compared with the other options. However, the choice for segmentation is often avoided, because of aesthetic reasons. Existing connections, even the most slender ones, result in a reduction of the transparency of the beam. While transparency is the key reason to use glass beams. In this paper a connection is presented that should improve the transparency of segmented glass beam. The connection is integrated in the least transparent part of a glass segment, the edge. It has a twofold effect; the transparency of the beam will decrease less, and by following the contours of the segment the connection is less noticeable. Since such a connection seems to be highly compatible with edge-integrated steel reinforcement, which can be applied to reach safe failure behavior, it is investigated how reinforced beam segments can be connected in an edge-integrated way. A connection is designed and its performance is determined by finite element analysis and physical testing of prototypes. During recent years, adhesives are more frequently used for glass applications in buildings, and according knowledge on adhesive glass-metal connections increased exponentially. However, further research regarding the performance of such connections remains indispensable to further optimise existing concepts or to develop and implement new technologies. To analyse the mechanical behaviour of adhesive glass-metal connections, computer simulations based on the finite element method can be performed. To do so, material properties of all components have to be introduced in the form of stress-strain curves, which can be obtained through experimental tests on adhesive bulk material. Here, the focus is on adhesives suitable to transfer significant loads between a structural glass panel and a thin-walled steel frame. In this contribution, the material properties of a structural silicone, Sikasil® SG-500, were determined through several experiments. Tensile tests on dumbbells, compression tests on cylindrical samples and thick adherends shear tests (TAST) were performed according to the available standards. Different displacement rates were considered to study the visco-hyperelastic behaviour of the structural silicone. Subsequently, possible theoretical material laws were assessed for their ability to approximate the experimental obtained stress-strain relationships. This paper describes the test procedures, reports about the fabrication process of the test samples, presents the obtained experimental data and proposes possible material laws for the silicone. From the tests, no significant differences in tensile strength and shear strength were obtained for the displacement rates used in this research. However, the stiffness in tension, compression and shear did depend on the test speed. Abstract: SentryGlas® foil has been used for over a decade as a laminating foil but also to bond metal inserts to glass. Most famously in the Apple cube and other Apple buildings and staircases. Although the joint is transparent and statically strong, little is known about the long term behaviour. Specimens were prepared of perforated stainless steel and glass. These were laminated using SentryGlas® foil. Tensile tests, fatigue tests and creep tests were conducted at room temperature and additional creep/fatigue tests at 40⁰C. The results are analysed and conclusions about the mechanisms involved and the safety are drawn. Façade failure due to seismic event represents a potential hazard to people and can cause serious damages to buildings with consequent high-cost remedial works. As a result, interest in the design of buildings and façades to resist seismic loads and displacements has increased. Current standards and literature recognize the benefits offered by Structural Sealant Glazing (SSG) systems to enhance the performance of unitized curtain walls exposed to earthquake but no precise criteria are available for the seismic design of the structural silicone joints. This paper proposes a design concept to evaluate the effect of forces and displacements imposed to the structural joints due to panel seismic racking; referring to the design philosophy developed by Japanese Standard, the concept is engineered based on three performance levels associated to different design requirements which aim at balancing costs and risks with no compromise on safety. Tensile and shear tests performed on sealant H-specimens and Hockman cycle tests simulating accelerated life cycles at different deformation rates are used to exploit the deformation capability of the joints correlated to residual strengths. Results from static racking tests on full-scale façade panels are used to validate the proposed design concept. Many studies reported in the literature are able to demonstrate significant influence of weathering on physical and mechanical properties of PVB. In this paper, the results of these researches are compared and discussed. The effects of rheological parameters modifications on the coupling capability of laminated glass structural elements and on the mechanical response to loads are then evaluated through numerical analysis. Real structures are often exposed to direct sunlight or to temperature or humidity levels that can induce damage phenomena in the interlayer; the modification of mechanical coupling capability and of adhesion properties of interlayer that effectively take place in laminated glass structures have to be taken into account in the design process as they probably affect the behavior of the structure not only in the serviceability state but especially in the ultimate limit state. Design and structural performance of laminated glass in over-head glazing applications like canopies, skylights is very critical as it has an impact on the safety of occupants of a building and its maintenance workers. For such applications post breakage strength of laminated glass construction is of utmost importance. Pre breakage strength can be predicted with reasonable accuracy by FEM technique based software packages, which allow the user to input mechanical properties of viscoelastic interlayers along with glass. This helps in interlayer based differentiation of pre breakage structural strength and design optimization. However, post breakage strength of glass is still an unknown area as analytical models for this are inconclusive so far and thus destructive testing is the only reliable solution. Impact testing, simulating the accidental fall of a maintenance worker was done to assess the “fall through” resistance of point fixed laminated glass constructions having varying interlayers viz, PVB, Ionoplast Interlayer, Stiff PVB, and EVA. In addition, medium duration (30 mins or more ) post breakage strength tests driven by the new requirements set in place by German Standard pr DIN 18008-6 were conducted at subzero (-20°C), room temperature (+21°C) and at elevated temperatures of +50° Celsius. The proper measurement and interpretation of modulus data for glass laminate interlayers can be quite complex. The development of master curves using different deformation modes and the preparation of the samples for measurement can significantly affect the results. International standard ISO 6721, determination of dynamic mechanical properties, uses modulus as a primary criterion for method selection. The shear modulus of polyvinylbutyral (PVB) materials varies to a great extent, e.g. 1 – 400 MPa, over the temperatures and durations encountered for glass laminates in a building. We have evaluated the use of tensile and plate-plate geometries for a regular and a high rigidity (“structural”) PVB interlayer material, as well as torsion geometry for a structural PVB interlayer material. In some cases, datasets from different sources have been compared. This paper will discuss the results we obtained using different methodologies, and explore the effect with regards to positioning of the interlayers in the “stiffness families” and the associated shear transfer coefficients as in draft European norms prEN 16612 and prEN 16613. Glass with a thickness of 0.55 up to 2.0 mm can be defined as a thin glass or even as ultra-light. On the market there are several suppliers, which offer such thin glass. On the one hand there are e.g. Gorilla Glass produced by Corning Incorporated or Leoflex by AGC, which are pre-stress by chemical treatment and on the other hand there are soda lime silicate glass products, which are pre-stress by thermal or chemical treatment. Not only the design with thin glass causes a totally new kind of thinking, also possible test scenarios for determination of the ultimate bending strength are currently not distinctly regulated in standards. Some existing test set-ups described in standards e.g. EN 1288 (four-point bending test or large ring on ring test) cannot be used for the determination of the ultimate bending tensile strength of thin glass. Different test set-ups published in several papers show possibilities for alternative determination of ultimate bending strength. These different configurations were investigated and analyzed for their applicability for determination of bending strength of thin glass. This paper gives a summary of theoretical investigation and shows results of experimental testing. Annealed glass has a high compression resistance but it is fragile and its tensile strength is low due to the random distribution of surface flaws and impurities, which induce cracks without prior warning and each crack is regarded as a failure. This phenomenon is dependent on surface micro-defects in the glass due to inclusions within the glass or to scratches caused by normal use and by the shaping process. Classical four point bending tests are not suitable for glass plates, because of the test’s configuration, the maximum stress is reached on the plate edges where, due to the cutting process, the defects are more likely than on the internal part of the plate. A satisfactory way of overcoming this uncertainty is the use of coaxial double ring tests in which the maximum stress is reached approximately in the centre of the glass plate, far from the edges so that the ultimate strength is not influenced by the defectiveness of the cutting edges. This test provides good results when a uniform and equibiaxial state of stress in the core of the specimen is induced because the geometric non-linearities are less significant in this condition. The EN 1288-2 European standard proposes applying an additional overpressure during the load phase, to compensate the second-order effect, especially in the case of big specimens where the non-linearities are more significant. The application of the overpressure makes the test more difficult to perform and furthermore some authors have proved that the induced stress state is not uniform and equibiaxial. In this paper the first results of a bending strength investigation on glass plates are shown. This investigation consists of a numerical non linear analysis in which the geometric non linearity is considered. At the same time an experimental investigation is carried out using coaxial double ring tests in order to compare the results of the numerical analysis with experimental tests using glass plates with different thicknesses. This experimental campaign will provide new and useful information on how to perform an easy testing method to evaluate glass bending strength without the use of overpressure. In modern-day architecture, transparent glass units are omnipresent as large façades, windows, floors and balustrades. To ensure safety in an accident, glass panels must successfully pass the 'human impact' test, described by the international standard EN 12600. This test setup consists of a steel frame in which the test plate is clamped with prescribed force; and the pendulum impactor, hanging from a steel cable. The impactor weighs a total 50 kg and is built up from a rigid steel core to which two small tyres are mounted. The window panels are assigned a qualification number as they remain intact, fracture without losing integrity or fragment completely in impacts from different drop heights. As experimental testing is expensive and time-consuming, there is an interest in numerical modelling to predict a qualifying glass panel, which is already allowed by the German standard DIN 18008-4. Several modelling approaches allow the impact simulation for intact glass panels. This paper presents a detailed numerical model for the pendulum impact which enables realistic simulation of impactor, frame and test plate, to be valid also for the post-breakage safety assessment of laminated glass. The model shows good correspondence for static compression of the tyres and for impact against a pressure plate. Further comparison is made for the impact on a laminated glass panel that remains intact. Although less suited for structural design qualification, the detailed model can be used for future simulation of the post-breakage response of laminated glass panels. In finite element simulation of glass cracking for practical engineering problems, the method of element deletion is often used despite its shortcomings. With this technique, an element is removed from the system upon reaching a certain failure criterion. Many different formulations for the failure behaviour of an element are possible, differentiated by the physical correctness of their representation and by their implications on the numerical stability of the calculation. In this paper, three failure models are characterised by use of a unit element model and evaluated for the drop weight impact on a monolithic glass plate. Several issues can be identified: (i) incorrect calculation of fracture energy for large-sized elements; (ii) shock wave propagation upon deletion of an element leading to spurious failure of other elements; (iii) unrealistic crack formation when the failure model does not account for crack directionality. A crack delay failure model for structural glass is proposed to avoid the aforementioned problems. This failure model uses only physical material properties as input and limits the damage rate during fracture. This paper presents the main challenges confronted during the construction of the innovative Crystal Houses façade in Amsterdam. Designed by MVRDV and Gietermans & Van Dijk architectural offices, the façade is a transparent reproduction of the previous 19th century masonry elevation, entirely made of adhesively bonded solid glass bricks. Even the window and door frames are reinterpreted by elaborated massive cast glass components. To obtain pure transparency, the resulting 10 m by 12 m glass masonry wall should be self-supporting. To achieve the desired structural performance of the wall a colourless UV-curing adhesive of high stiffness is selected which reaches its optimum bond strength when applied in 0.3mm thick layer. The virtually zero thickness of the adhesive and the desire of untainted transparency induced various engineering challenges, from the adhesive’s homogeneous application and the dimensional accuracy of the bricks to the allowable tolerances in the entire façade. This paper records the challenges encountered and follows the innovations made from the manufacturing of the bricks to the final construction of the façade. The novel solutions include the manufacturing of glass elements of extreme dimensional precision, the development of methods for the accurate measuring and systematic levelling of the façade and the development of customized bonding techniques that lead to purely transparent and flawless connections. Based on the conclusions of the research and experience gained from the realization of the project, suggestions are made on the optimization of the developed system for its further applicability. Inspired by the glass masonry technique developed by the TU Delft Glass and Transparency Lab for the Crystal House in Amsterdam, a 14 meter span pedestrian bridge is envisioned, also consisting of cast glass elements. In contrast to the Crystal House project that employs an adhesively bonded glass block system, here dry assembly of the glass elements is proposed to allow for a demountable structure. To achieve this, a constant compression force is introduced in the bridge through its arch-shape. This compression force and a special interlocking geometry of the blocks will ensure the stability of the structure, like a medieval stone arch. The paper will discuss the exploratory design and engineering leading up to the construction of the first 3 meter span mock-up. This includes studies on the visual appearance of the bridge, studies on the glass block geometry, calculations on stresses in the glass elements, experiments on force transfer through dry-connected elements and mould design for casting of the complex geometries of the glass elements. In projects involving swimming pools with structural glass, ABT Consulting Engineers has faced similar design requirements: maximal transparency, proper detailing, 100% water tightness and robust behavior. ABT developed a straightforward detailing to satisfy these requirements. The concept is applied in the glass swimming pool of the 900 Mahler project, where the layered and heat strengthened glass panes were designed with specific attention to the appropriate type of interlayer and functional, durable and practical support detailing. The implementation of a clear safety philosophy, backed by an executed risk analysis, led to a glass structure which functions in all circumstances. The panes were structurally analyzed on strength and stiffness with finite element software, with extra focus on the appropriate properties of the support conditions. The concept is ready to be applied in similar glass pools. In January 2015 a pavilion mainly built of glass was finished. The building contractors themselves planned it as a transparent extension of their detached house to the garden. The structural system consists on one hand of a glazed steel frame with four stanchions rigidly fixed to the base plate and connected by four transoms at the top and on the other hand of two laterally glass attachments. These are made of vertical load-bearing glass walls and a horizontal glass roof, which are connected among each other by structural sealants. Together with an anchor profile that is completely hidden in the joint gap, the glass elements are also acting as bracing elements. Specifications of the building authorities called for a structural concept of the pavilion’s glass attachments for different states of destruction. In addition extensive requirements had to be fulfilled to obtain a special building permit for the structural sealants. The project is an outstanding example for the possibilities in constructing with glass. It combines the structural features of a load bearing all glass building with state-of-the-art joint techniques. The design of the structural glass for the Manchester Town Hall Link (completed 2015) was carried out by engineering consultancy Eckersley O’Callaghan (EOC). The glass facade forms an enclosed shell which supports a steel roof and acts monolithically to resist lateral loads. The project collates the latest advances in glass technology combined with innovative design methods. In the absence of explicit codes of practice for structural glass, EOC performed a first principles approach in using empirical data, acquired through previous projects, and analytical methods, including FEM and parametric modelling, to justify an elegant and efficient structure which was approved by building control authorities. The result has reduced glass joints and less visible metalwork to meet the architects’ aspirations. This paper describes the approaches and innovations in designing the structural glass for this project. ZJA Zwarts & Jansma Architects have designed a new departure light rail station in The Hague, Netherlands. The spatial roof structure of the station is made of rolled rectangular steel hollow sections, arranged in two independent layers rigidly connected to each other. A glass envelope covering the roof structure is matching the contours of the steel exactly. Since the diamond shaped glass panels can only be attached to the outer layer of the steel grid, the glass with edge lengths of approximately 1,30m is two-side supported. When optimizing the overall geometry the double-curved area at the nose of the roof structure became a special focus. Knippers Helbig Advanced Engineering has managed to minimize the deviation of each single glass panel from the single curved geometry to a maximum out-of-plane deformation of only 3mm. Thus, stresses due to warping effects caused by imposed loads including deformation of the primary structure are within the allowable range for heat strengthened (HS) as well as for float glass (AN). The project is a great example of how geometry development can influence glass design, enabling new approaches. This paper illustrates the design process and the load testing of a steel-reinforced laminated glass beam built for a 6 m span glass footbridge. This specific glass footbridge has been designed and tested to join two existing floors of the main room of a refurbished masonry building of the 19th century public slaughterhouse of Pisa. To meet the needs for transparency asked by the Municipality of Pisa the beams, the running surface and the balustrades, were made of laminated glass. The project started with a design of a 5790 mm length beam which has been designed and checked using analytical and numerical modelling. Previously a series of 4-point bending experimental tests had been performed on 6 specimens of 2000 mm steel-reinforced glass beams at the University of Pisa in order to validate the accuracy of both the numerical and the analytical modelling. A final load testing has been done on the footbridge and the results have been compared with the numerical findings. The paper illustrates the project for a structural glass walkway that will connect two important historical buildings in Pisa, Palazzo delle Logge di Banchi and Palazzo Pretorio, which are currently used as administrative offices by the City Council. The entire project is developed with particular attention to the conservation of those buildings, the idea is to build a transparent glass footbridge that does not distract people’s attention from the surrounding buildings. The pedestrian walkway has a span of 9.15 metres over the main pedestrian and commercial street of Pisa. In order to combine the demands for both high transparency and fail safe design, the structure will be realised with laminated jumbo glass slabs as main load bearing structure and with joints properly developed to ensure a mutual collaboration of the structural elements. The result of the project will be a complete transparent footbridge with small joints that satisfy both the architectural and the safety requirements. For the design of the Visitor Centre of ‘Park Groot Vijversburg’ at Tytsjerk, The Netherlands, the limits of structural design are examined, resulting in one of the largest glass bearing structures. The architectural design is by Junya Ishigami and Marieke Kums of Studio Maks. In plan, the shape of the Visitor Centre is as that of a triangle being pulled firmly in three directions while maintaining a central hall. The architectural design exists of a glass façade with roof only. During the design it became clear that it was the architect’s wish not to have any structural elements visible. The critical part of the wings is the cross section, since there is no possibility of adding a lateral resistant element in the section. Using the experience with glass balustrades, the structure is made with clamped glass sheets, that acts like a portal construction. The triangle shape of the main hall is capable of producing lateral support in all directions, just by in-plane actions. The roof structure of steel acts as the diaphragm fixing the triangular shape and distributing the forces to all three sides. By using only the glass façade the load bearing and lateral system is being formed, with simple mechanical principles and use of the spatial effect. All connections are proven techniques in glass balustrades and facades. Combining all these techniques into one building, with no additional structural elements, brings the design of glass structures an important step further. The visitor centre is planned for completion in 2016. Enclosed envelopes without any visible supporting structure or stairs which seem to float on air are the dreams of many architects and designers. Glass is one of the few materials that can allow this dream to become a reality. For this reason full glass structures can appear to be practically invisible and the observer experiences the wonderful sensation of seeing a floating, weightless and totally transparent structure, as if it's almost not there. To fulfill these demands but also to enable the integrity of the whole glass structure, the connections between the elements represent one of the most critical aspects for this type of glass design. These connecting elements represent the “remaining visible” parts and therefore these details become the central focus of interest when looking at an all glass structure. Simple borehole connections often do not satisfy the architect’s demands these days. In this article we will show a few of our recent all glass structures with a keen focus on the all important "connecting parts". There will be shown a solution with special glass treatment for a customized structure as well as applications for transparent glued connection elements which can be used by the industry in general product applications. The generalization of connecting details in the use of load carrying full glass structures could open new fields of application for full glass structures apart from the typical and well known façade industry. Canopy for the Tram and Bus Stop "Krefeld Ostwall"
The „Ostwall“, one of Krefeld‘s most important public traffic intersections, is getting modernized completely for the moment. The highlight of the project is the new canopy for the tram and bus stop. It was decided to realize a steel-glass structure, to get most possible transparency. The structure has a length of 125m and a width of 12m. The main structure has 9 column brackets, that are bearing a space truss. These elements are made of steel. For the roofing, partially curved glass elements are used, that are bonded to a stainless steel frame by structural silicone. The slope of the roofing reaches to the gutter in the middle axis of the building. For each side, only one glass element is used, to guarantee a good flow of rain water. The glass elements have a developed length of 5.2m and a width of 2.2m. At the front ends of the structure, spherically curved glass elements are used. The glass roof is accessible for cleaning and inspection work. To get a smooth view of the bottom surface, the glass is bonded under the steel frame, so the silicone bonding is used to bear the self-weight of the glass elements. The pre-fabricated elements are fixed to the main structure at the bottom girder of the framework directly, and at the top girder by a suspension bar. To get a minimized cross section of the stainless steel bars, they are stabilized by the glass elements to prevent them from torsional-flexural buckling. In current practice, glass shear walls are frequently used to cover wide surfaces in facades. There, a multitude of restraints can be found, depending on specific aesthetic, architectural and structural requirements. Typical practical examples can in fact take the form of linear adhesive joints, metal frames or mechanical point fixings, etc. From a practical point of view, as a result, it is clear that compared to idealized boundary conditions the actual restraints should be properly taken into account. In this research paper, the shear buckling response of glass shear walls is assessed by means of Finite-Element (FE) simulations and analytical methods. The role of (i) linear adhesive joints, (ii) metal frames with interposed adhesive joints or (iii) point mechanical connectors on the theoretical buckling resistance of these panels is first assessed (e.g. in the form of fundamental buckling shapes and Euler’s critical loads). Analytical fitting curves of general applicability are proposed, so that classical formulations derived from shear buckling theories could be used. Subsequently, the actual shear buckling resistance is also assessed, e.g. by taking into account the effects of possible initial geometrical imperfections, damage in glass or in the adopted restraints. This goal is achieved by means of accurate but computationally efficient FE models able to reproduce (via mechanical connectors, surface-to-surface interactions, etc.) the desired mechanical effect of restraints, as well as any possible local damage in them. As shown, rather close agreement is found with a past normalized buckling curve in use for ideally simply supported glass shear walls. It is thus expected, in view of further investigations and full-scale experimental validation, that the current research outcomes could provide a useful theoretical background for the implementation of standardized buckling design methods. Surface damage that accumulates on the surface of glass is known to govern the strength of this material. It would therefore be very useful to use artificial ageing techniques to replicate this level of damage; this would allow a rapid and cost effective assessment of the expected glass strength and the long term performance of novel glass products and treatments. Some artificial ageing methods exist but it is unclear whether the surface damage induced is correlated with the physical damage found in naturally aged glass. The aim of this paper is therefore, to evaluate available artificial ageing methods of glass using as a reference naturally aged annealed glass. The artificial ageing methods of the as-received specimens involved the induction of: (a) a single flaw on the as-received specimens with a custom-made scratching device (SC series); and (b) uniform damage to the specimens with the use of dropped grit (SA series). Each ageing method was then evaluated with destructive and non-destructive testing. These results were then compared to those obtained from the naturally aged glass (NA series). A 65% reduction in mean strength with the respect to the as-received annealed glass was noted for the naturally aged series. This reduction was approximated (62-79%) by the artificial aged series. However, a perfect match has yet to be found especially when other fractile values of strength as well as surface roughness data are also taken into account. Nevertheless, in general the SA series were found to perform better than the SC series. The applicability of the Weibull distribution to model the strength of glass, the existence of a size effect on the strength and the need for a non-destructive testing of the strength are discussed and reviewed. There are a growing number of studies that put into question the applicability of the Weibull distribution to model annealed glass fracture data. A recent study indicates that the breakage stresses are uncorrelated with the surface area, in violation of the size effect which entails the Weibull model. It is shown in this paper, however, that there is a size effect, as evidenced in an objective way by hypothesis testing using the likelihood ratio statistic. In numeric simulations it is shown that, given sample sizes of 30 specimens and the Weibull distribution being assumed, it is necessary to employ specimens which vary in surface area by a factor of about two at least, in order to detect the size effect with a success rate in excess of 0.95. To increase the use of soda-lime-silica glass in load-bearing components, however, there is a need for non-destructive testing methods, such as non-linear ultrasonic techniques. Non-destructive testing could be used not only to single out the weakest glass panes during manufacture, thus decreasing the variation in strength among as-received specimens, but also by other parties in the construction sector, such as in routine inspections on-site. Suitable stochastic models can be used together with such testing methods to develop a non-destructive strength grading of glass products. Designers use exposed glass edges for decoration, for example within glass steps, glass beams or glass columns. This application requires a mechanical finishing to achieve a high optical quality by compensating a misalignment of the glasses, for example an edge displacement, or a supernatant of the foil resulting from the lamination process of safety glass. Regrinding of annealed glass is allowed without restrictions. In the case of tempered glass there is a risk of premature failure caused by a reduction of the compression zone. During a research project at the Institute of Building Construction, Technische Universität Dresden, the impact of the grinding depth of tempered glass on the bearing capacity of the edge is investigated. The goal is to give a strength value of reground tempered glass edges. We conducted four-point bending tests on glass beams about the strong axis in the style of EN 1288-3. The experimental investigation included 82 glass beams both made from fully tempered and heat strengthened glass in thicknesses of 6 mm with reground edges in varied grinding depths and additional reference specimens. The experimental investigation shows that an increasing grinding depth induces a decrease in edge strength. In the presented case, the result of the test series allows the definition of reduction factors for the calculation of the bending strength of glass beams with reground edges. Glass has been used as a prized construction material for centuries. Typically it has been used as a window infill, initially designed empirically where thickness available was adequate for the sizes available. As technology has proceeded, the size of glass available has increased by orders of magnitudes and standards have been written to guide the design in windows. Glass remains unique amongst the construction materials, that failure and replacement is considered an acceptable price to pay for the transparency of glass. The same logic has, however, limited the use of glass as a ‘structural’ material, despite the numerous built examples of it performing adequately. If it is acceptable for glass to break and collapse in some circumstances and not others, how does a standard define that boundary? The challenges for standardization are both numerical and philosophical. The means of forcing glass to behave with a robust manner with failure mechanisms that incorporate redundancy and retention generally comes through lamination. But the question is what to require when? Additionally, the performance of the glass in the composite is stress-time dependent and the stress itself is load-time-temperature dependent. This paper describes the philosophical and numerical challenges to writing a structural glass standard, the concepts of glass importance factor, post-failure loads and durations and progress that has been made in the drafting of an ASTM Guide to the Design of Structural Glass. The new German Glass design standard DIN 18008 – parts 1 to 5 – was finally established in the beginning of 2015, being accepted by the authorities already a few months earlier. As the application is obligatory since then, a lot of experience could be gained in the meantime. Every standard has to pass several steps of control and revision before being approved. Nevertheless the actual application brings up new aspects and questions about certain details and the corresponding interpretation and intention of the standard. The following paper will discuss some important aspects of DIN 18008 in order to provide some clarification for the users of DIN 18008 and some input to the working groups of the future European glass standards as well as for the next review of the DIN 18008. Related papers are separately and independently published at Glass Structures & Engineering (Springer) and are available at https://link.springer.com/journal/40940/1/1/page/1.